The Mid-Atlantic Backcountry Discovery Route is a 1100 mile planned route through VA, TN, WV, and PA. The route attempts to allow a seasoned Adventure Rider to navigate the 1100 miles, exclusively using Dirt Roads, and Country lanes. Like all BDRs, the objective was, and is to allow a rider to ride N>S or S>N over fire roads and other dirt roads. On the East Coast, unlike the BDRs on the West Coast, there are simply not enough dirt and fire roads to accomplish the goal, and so the compromise of using more “country lanes” was accepted, and the MA BDR was born. Each segment/leg of the BDR has been color-coded, using alternating colors of red and green. Click on the picture to see the details. Most of us on the East Coast have been very excited about the ride since it was created in 2017. It was back in August that our local BMW dealer attempted to setup a group ride over this 1100 mile route, but scheduling conflicts for the ride leader caused him to cancel the ride. Almost immediately, a smaller group of riders decided to run the course without any oversight or support from the dealer. We were a small, unorganized group of enthusiastic riders who would need to get organized, and go out and have some fun. It’s important to note that we call a ride like this fun, which seems to be a holdover from our youth, where every young boy and some young girls loved to ride their bicycles through the woods, through mud, over jumps, and along narrow woodland paths. It seems that even at age 60, riding in the woods on a “bike” is just as much fun as it was when we were kids, although now we’re using 600 lb motorcycles, and the distances are far greater. And so, on Tuesday, Oct 2nd, several of us met at a gas station in Iron Station, NC, where we began the journey North, to Abingdon, VA, where we’d spend the night, and meet the rest of the group the following morning. The group consisted of 7 riders of varying levels of skill, who come from all walks of life. Some riders had a lot of experience, had participated in numerous off-road skills development classes, and would be classified as skilled riders, while at least one rider had recently purchased his BMW R1200 GS motorcycle, and had only 100 miles of off-road experience. How many miles, how many days? 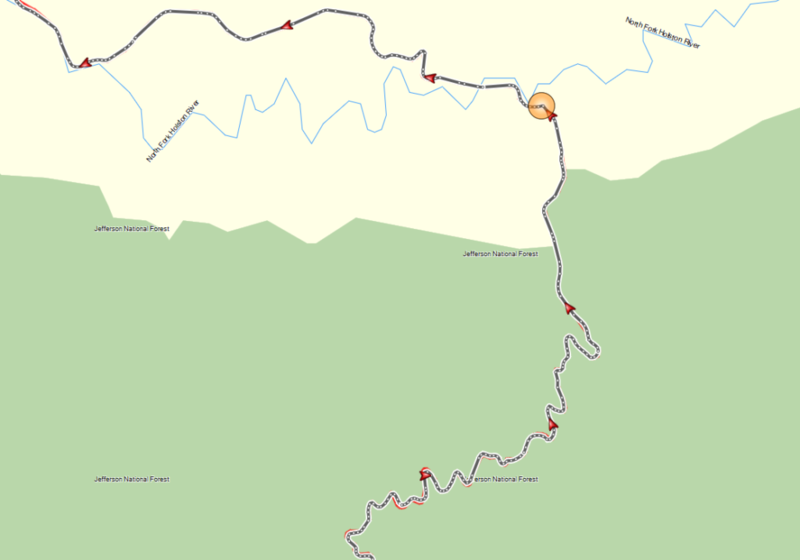 The route is designed so that it can be done in 9 days, with the end of each day terminating in a small town, which offered a reasonable array of choices for food and lodging. In our case, with the different skill levels involved, coupled with the fact that most of us had never ridden together as a group, over remote and rural tracks, we were unsure of how many days we might need to complete the route. There were numerous discussions about how often to stop, when and where to eat lunch, how many days could or should we combine to shorten the duration, and of course, should we camp or stay in hotels. For me, this last question was the easiest to answer. I planned on spending the night in hotels, which would provide me with a good shower, clean and comfortable bed, and a way to have dinner without needing to setup stoves, etc. So, some of the dies had been cast, while others would play out over the ride. It was now time to get on the road. After a somewhat dubious breakfast at a Cracker Barrel in Abingdon, we hopped on the bikes, and headed for Damascus, VA, a 10 mile ride from our hotel. We met at the declared starting point, a somewhat unassuming Citgo Gas Station in Damascus. After a few minutes buying Gas and Gatorade, we headed out. Only 6 miles after starting we were stopped by a DoT team who was paving one of the access roads. We sat at the safety check for almost 10 minutes, While sitting at the safety check, I was a concerned that my GPS was not showing the route that we were on. My GPS was regularly telling me to turn right, or left, when the actual route was in the other direction. So, it became obvious that something had gone wrong with my GPS route, and so I was going to need to mostly abandon my route, and follows the others. For the rest of the ride, I would be given false readings by my GPS, of the Distance to the end of the route. We like to classify roads as being paved, or unpaved, with some of the unpaved roads being further classified as Technical or Very Technical. But this simple way of classifying dirt roads does an injustice to telling the story of riding on dirt. You see, even a dirt road, which doesn’t have gravel or sand has it’s share of obstacles that can cause problems. For example, roads like this develop numerous potholes, can be quite muddy, and in the fall, are often covered in leaves which can cause “extended braking zones”. In our case, all of the above were present, with numerous potholes, some filled with water, coupled with some mud, and lots of leaves was what we would have to deal with. In addition, many of these roads also had gravel. The gravel would vary from small, and sparse, to large and deep. The stretches with small stones, which were not deep were relatively easy, but as you come upon and ride on stretches which have deeper gravel, and stones of 1″ or bigger can cause a high degree of discomfort. Riding over millions of these 1″ stones causes the front wheel to constantly move off-line as it rolls off of the stones, letting the tire “fall” to the right or to the left. I’ve inserted a clip from the Internet that shows how we train for riding in gravel and sand. I’ve attended numerous days of training at Rawhyde Adventures, located in Castaic, CA, and they did an excellent job of putting us through the sand and gravel traps, demanding that we do figure eights in the sand, and traveling the length of the gravel garden without touching a foot to the ground. Enjoy. For seasoned riders, this type of terrain can be dealt with without too much drama, but for a novice rider, this type of terrain creates a never-ending feeling of uneasiness. Riding along at speeds of 25-40 mph, you never feel like you’re completely in charge, and that you’re a passenger who is simply trying to “keep it going”. And so, all of this begs the question of what the pace or speed should be. How fast should we, or could we ride? Each rider has to pick a pace that is good for themselves. Riding in a pack, following the rider ahead gives one a pretty good feeling for the skill and speed of those around you, but it’s often the case that the rider ahead and behind you are comfortable at a pace that is different from your own. Throughout much of the first hour or so, I was riding very close to the front of the group of 8 riders. I was very comfortable with the terrain, and while I was experiencing the “wandering” that I described earlier, I was able to move along at a pretty good pace. As I got more comfortable, I increased the pace, and was making excellent time. I was at 42 mph approaching the turn, which was a 70 degree left hand turn. I knew that I was going too fast as I started to apply the brake. Within half a second, the back end started to slide as I approached the turn. I was looking carefully at the edge of the road, calculating what I could do to change the speed and entry angle for the turn, that would allow me to make the turn without riding off of the road. The entire braking process took place over about 180′ in total. This includes 141 feet where I was still traveling at about 20 mph, followed by 38 feet of “aggressive braking”. I carefully applied rear brake, depressed the front brake looking for more effective braking from the front, adjusting the pressure of both brakes while trying to extract maximum braking, allowing me to make the turn. And so, if I had done all of this correctly, and my speed was reasonable, I would have come through the turn, once again, chalking it up as a minor miscalculation. But that’s not what happened. What actually happened was that the bike began a long, slow, and straight slide towards the side of the road. I carefully steered the bike to the left, trying to avoid riding off the road, into the woods. The bike was in a slide, and as I approached the turn, and the side of the road, I found myself saying… I got this, I got this, I got this. Those were the words that I heard in my head, just as I left the road, and proceeded to get tossed over the high side of the bike. The fall was very slow, and when I say that I was high-sided, it is more accurate to say that I fell to the right, down a 2′ drop-off. The wheels of the bike were at the edge of the road, while the bike was leaned off the road, to the right. The 2-3′ droppoff was quite significant, in that after the bike had fallen, from the road, all that was visible was my two wheels, now horizontal instead of vertical, and the beautiful black skid plate, which protects the underside of the engine. As I started to put together this analysis of the crash, I thought that some of you might think that I’m guessing about my entry speed, braking distances, and other important points within my analysis. So, I thought that I’d share with you the data screen that I was looking at, giving you a rare, and hopefully interesting view into what happened. 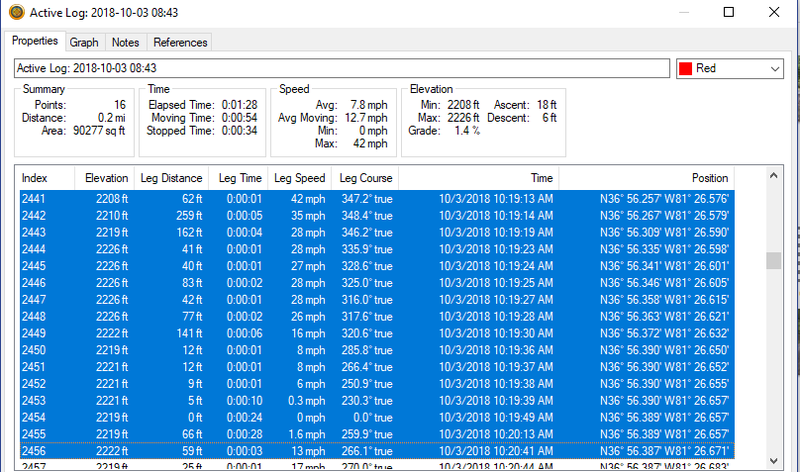 Looking closely at the data above, you’ll see that I started to decelerate at 10:19:28 AM, and by 10:20:13, just 45 seconds later, I had already gotten the bike to an upright position, and begun walking it forward. Think about this for a moment. I crashed, my fellow riders stopped their bikes, and came over to offer assistance, we then lifted the bike up, and walked it forward, all of which took place within a 60 second period. Absolutely extraordinary! Looking at the map below, you can see the overall length of Segment #1. Segment #1 is a stretch of 140 miles,The yellow circle shows the site of the crash. You can see that my crash happened at about the 46 mile mark, about 35% of the total distance. The map below shows how I might have fallen into a brief period of over-confidence, which caused me to be clipping along at 42 mph, suddenly realizing that I should be going slower. Notice that I had just ridden through a good number of twisties, and was feeling somewhat invincible. The straight allowed me to get a good bit of speed going, and the turn came as a bit of a surprise. So, there I was, laying on the side of the road, the bike laying on top of me, with the engine still running, and gas dripping (it felt like the gas was pouring out of the tank) out of the tank, covering me, and the underbrush on the side of the road. I was “tossed” from the bike, but I did not land far from the bike. Actually, as I noted, I was still under the bike, resting on my side, trying to figure out what comes next. I had hit a rock when I fell, and although I was not in Shock, and was not feeling any pain, I knew that I had a minor feeling in my ribs, which I suspected was nothing to worry about. I was disoriented, but I needed to get the bike turned off ASAP. You don’t want a motorcycle laying on top of you, with the engine running, and gas leaking. Bad Situation – It must change immediately. So, I thought for a few seconds, and figured out the the on-off switch was on the handlebar that was under the bike, so I reached in, tugged on the handlebar to expose the kill switch, quickly turning the bike off. It had only been 30 seconds since the crash, but at that moment, I realized that I would need quite a bit of help to get out of this mess, so I called out to the riders that were beginning to arrive that I needed help, and that gas was leaking. So, if they could see their way clear, I would greatly appreciate it if they could hurry. Within 10 seconds or so, I received help from Michael Bass, and one other rider, and relatively quickly, the bike was standing upright. I made my way around the bike, started the engine, and using the clutch and handlebars, I used the bike’s engine to “walk it forward” until it was back on the road. Everyone was concerned about my health, and they asked if I was OK. I reported that I was fine, no injuries, and no pain. Numerous folks said that I should stay put, because I might be in shock, but as it turned out, I was very calm. I was not feeling any of the stressors that come with an adrenaline rush, and I was ready to ride. As fate would have it, one of the other riders had just turned on his GoPro camera, and although he was 4 bikes behind me, he came upon the carnage, and was a little bit baffled as to what might have happened. You can hear Tom wondering, out loud, what happened, trying to see the problem. But, from the video you can see that the bike was well and truly off the road, and since it was tipped on its side, leaning into the woods, it almost did not look like a bike at all. It took me a minute to convince everyone that I was ready, but we regrouped, and headed off to continue the trip. The BMW GSA, in particular my GSA is covered with what amounts to an exoskeleton that is designed to keep the bike safe, in the event that it is dropped, or in an accident. The net result of my crash was that my Right Front Brake lever had broken off, and the right front blinker had come out of it’s socket. I would need to purchase another front brake lever, but the repair to the blinker took less than 2 minutes. These bikes are amazing, and aside from a bit of mud on the windshield, and the two issues, the bike was working perfectly, and while the rider should not be described as working perfectly, I was once again in good form. Over the rest of the ride, we had several other folks drop the bike. To be honest, I’m not really sure how many drops we had, but I heard that there may have been at least 6, and maybe as many as 10. Over the rest of the trip, we stopped the bikes and waited for folks to catch up after a drop at least 4 times, but we know that there were 4 drops at a single location. Let’s say that you don’t ride motorcycles. You are reading this Blog Post wondering if you’re listening to ravings of a crazy man. I mean, I crashed, got the bike upright, and was riding away within 90 seconds, being largely focused on “hitting the road again”. You might be thinking that it’s insane to be involved in an accident like this, and to brush it off with such a relaxed attitude. But, to an Adventure Rider, there is a saying that is similar for all motorcyclists. The saying goes like this… There are two types of Adventure Riders, those that have dropped their bike, and those that are going to drop their bike. I’m sure that all of you have heard something similar, but the saying tries to make it clear that riding a big bike over technical terrain, and gnarly obstacles is challenging, and it’s only a matter of time until every rider drops their bike. So, don’t think me a irrational, and depraved patient of an insane asylum, think of me as just another statistic, that made a small error, that ended well. We continued on for another 4 hours of riding, periodically regrouping and collecting the group after a drop, riding another 15 minutes or so, and then regrouping again. We finished the first leg at about 3:30, taking longer than anticipated, but still within the timetable that we set for ourselves. At the end of Leg 1, we stopped at a gas station and talked about leg two. In the end, I decided to ride directly to the hotel, giving a hand to one of the newly minted dirt riders that was exhausted after a long day of riding. He and I headed to the hotel bar, and enjoyed a nice cold beer, in a smoke-filled dive bar. The group split up, with some camping at the end of Leg 1, and others continuing on to the end of Leg 2. We met in the hotel restaurant at about 7:30 or so, and enjoyed a reasonable dinner, and then headed off for the evening. The group is planning on continuing on to the end of the BDR, covering the remaining 7 stages over the next 5 days. I had tickets to see the Marshall Tucker Band in concert in Asheville, NC and I wasn’t about to miss that, so I headed home. Cliff Musante is a technologist, business leader, motorcycle enthusiast, father, grandfather, and more. In June, 2013 his passion for motorcycles was revitalized, and he set out to ride across Patagonia. Since then, he's logged thousands of miles, ridden across the US, and is planning a trip through Russia and China. This 'Blog is the story of all of his adventures.